Services provided: Campaign planning, website design and content, video services, social media, media relations and campaign management. 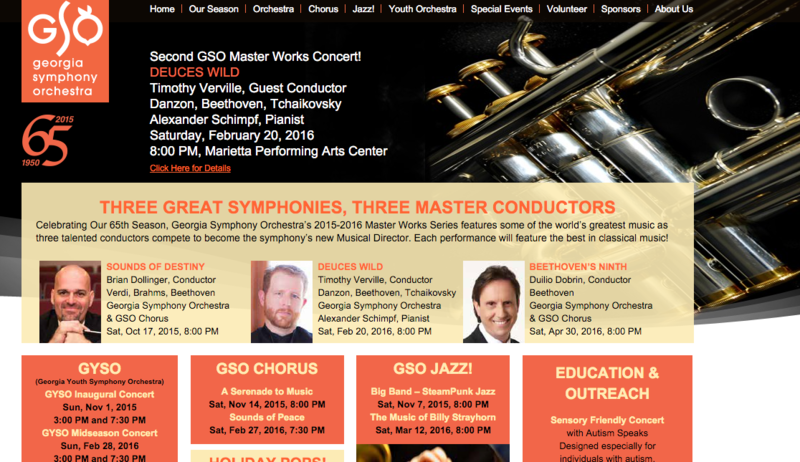 Celebrating its 65th season, the Georgia Symphony Orchestra is auditioning three candidates for music director and needed to refine and enhance its community outreach and marketing to improve attendance at events, broaden its footprint in the Atlanta metro area and create new sponsorship opportunities. O’Neill Communications refocused GSO’s strategy on promoting and selling the “whole season” and the excitement of the search. We redeveloped the existing website to accommodate that approach, produced a season-long brochure, implemented a consistent media relations program and enhanced GSO’s social media program. In addition, we assured placement on appropriate community calendars, began using paid and donated Google Ad Words, Facebook advertisements and testing the effectiveness of SpinGo and Eventful promotions. The firm realigned the GSO website by updating the homepage to attract more users to the offerings of the 65th season, highlighting the search for the new music director and special concerts such as Holiday Pops and its first sensory-friendly concert with Autism Speaks. Through a concentrated effort, Georgia Symphony Orchestra saw a 12% increase in ticket sales for the season opening concert, Sounds of Destiny, from 2014. It received features in major newspapers – Marietta Daily Journal and The Atlanta Journal Constitution – for the new season and the search of a new music director. Organic social media growth was steady. Facebook fans grew by 7 percent. Engagement went up by 96% starting September due to the heavy promotions and strategic and impactful content for the 65th season of the symphony. Just five events into the season, the executive director and president are pleased with the new consistency in the planning and implementation of community outreach and promotion. In addition, a thorough assessment of the community outreach campaign is underway.